Update: August 17th, 2012 – According to the Odessa Chambliss Quality of Life Fund website, the 2012 golf tournament has been cancelled. Each year Shaquille O’Neals mother, Lucille O’Neal, puts on a charity golf tournament and banquet to support the Odessa Chambliss Quality of Life Fund, a fund that provides grant supplementation for individuals pursuing a career in nursing, and to assist those students who require incidentals such as medical supplies, laptop computers and necessities that are not accessible through basic tuitions. 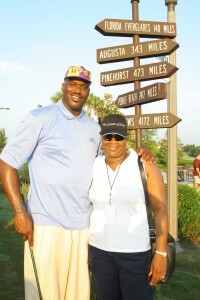 The fund is named after Shaquille’s grandmother, Odessa Chambliss, who died of breast cancer in 1996. Shaquille O’Neal started his basketball career many years ago with the Orlando Magic as it’s star center. Even though Shaq would move on to Los Angeles for his professional career, Shaq and his mother have continued to keep their residence in the Orlando area and have organized the Shaq’s Mama Said Knock You Out Charity Golf Tournament and Midday Soiree the last several years. The 2011 event will be held at the Shingle Creek Golf Club on Friday, September 17, 2011 at 8 AM with the soiree beginning at 1:30 PM. The soiree is a fun-filled and nostalgic afternoon of good food, good music and good friends. Evoking a 1930s-style “Cotton Club” atmosphere, the “Soulful Midday Soiree” will feature smooth jazz, a hearty buffet of soul food favorites, as well as friendly back-room poker, table games, dancing and more. The cost is $3,000 for a golf foursome which includes the soiree, $75 per person to attend the Soulful Midday Soiree only. Shaquille O’Neal and Charles Barkley have attended the event in years past.